Most visits to a new doctor, specialist, or hospital begin with the familiar barrage of questions asking you for an accurate account of your wellbeing. Always included in this is “do you or any immediate family members have a history of…”, frequently leading to a long pause as you think to yourself “where do I begin?”. Being prepared for this question before you head to the doctor will help you communicate the important specifics and not leave anything out. The primary reason for a medical history is evident: many major health conditions are genetic, so if a parent was afflicted with a particular illness like heart disease there may be an increased likelihood you can be too. However, immediate family members living in the same household share much more than genetics. For starters, they are all exposed to the same environmental factors such as air quality and toxins. It is also likely that they have similar eating, sleeping, and lifestyle choices. Genetics may predispose a person to diabetes, but the family’s habits of poor diet and exercise could be the determining factor in its onset. Keep in mind that a predisposition does not mean you are guaranteed to be afflicted, just that the chances are more likely if preventative measures aren’t taken. 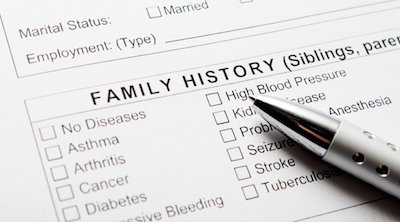 The first step in creating a snapshot of your family’s medical history is to begin at home. Start with yourself, spouse, and children, paying careful attention to the age when symptoms were first noticed. Casual family conversations such as “didn’t the men on your father’s side all have that problem?” are an easy way to gather information without it feeling too invasive or formal. If you’re unsure of what questions to ask, a great framework is the Family Health History Checklist. Maintaining a notebook with each family member having their own page is an easy way to collect your results, as are tools like the Family Health Portal. Sharing the results of your efforts means everybody in the family benefits. A half-sibling might have many missing pieces in their health history, so your research will fill in some gaps. Your diligence in keeping this list up-to-date will be a relief to your doctor (as well as your family’s physicians). Instead of getting (often incomplete) information from you when time is limited during an office visit, a scheduled appointment for review of your medical history can be more effective. This new understanding of your medical snapshot may mean your doctor recommends certain screenings or tests at various ages based on when issues arose with family members. He/She may also advise you and your family on lifestyle changes to lower the risk of certain conditions and prevent the worsening of existing symptoms. It is important to remember that our doctors only know what we provide them. Accurate answers to questions about our family medical history are a crucial tool for healthcare professionals, helping them prevent, diagnose, and treat our illnesses more effectively while increasing our overall quality of life.